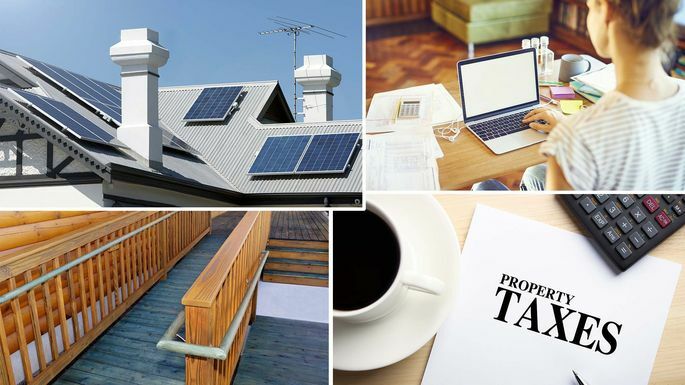 What are the tax benefits of owning a home? Homeowners might be wondering this right around now as they prepare to file their taxes. Or, you might be wondering how the new tax plan might affect the tax perks of homeownership when you file next year. Well, look no further than this complete guide to all the tax benefits of owning a home—for this filing year (2017) as well as the next (2018). Read on for the full rundown just to make sure you aren't missing anything that could save you major money! Here's how this deduction looks for a married couple in the 28% tax bracket (that means a joint annual income between $151,201 and $230,450) who bought a home with a $300,000, 30-year mortgage at a 4% interest rate. They will pay $11,904 in mortgage interest their first year. Once you add in the other itemized federal deductions below, these homeowners can expect to save at least $3,333 in taxes during their initial year of ownership. What changes next year: The new tax bill allows homeowners with a mortgage that went into effect before Dec. 15, 2017, to continue to deduct interest on loans up to $1 million. But for anyone who closed on a mortgage after that, the cap for deducting interest becomes $750,000—and that's a combined total for first, second, and any other homes. In most instances, property taxes are deductible on your 2017 tax return, says Brian Ashcraft, director of compliance at Liberty Tax Service. And that could spell hefty savings. According to the U.S. Census Bureau, the average household property tax is $2,127. If you have a mortgage, your taxes are built into your monthly payment. Here's more info on how to calculate property taxes. What changes next year: Property tax will no longer be a separate deduction. Instead, taxpayers can take one deduction that includes property tax as well as state and local sales and income taxes, says Ashcraft. And that one deduction is capped at $10,000 for those married filing jointly. If you put less than 20% down on your home, odds are you're paying private mortgage insurance, or PMI, which costs from 0.3% to 1.15% of your home loan. While the deduction had expired, the new tax bill retroactively made the deduction available for the 2017 tax year. Here's how much you'll save: If you make $100,000 and put down 5% on a $200,000 house, you'll pay about $1,500 in annual PMI premiums and thus cut your taxable income by $1,500. What changes next year: This deduction is for itemizers only. Plus, the 2018 tax law nearly doubles the standard deduction. As a result, it is estimated that only about 5% of taxpayers will itemize deductions starting in 2018, says Connick. "In the past it was more like 30%," she adds. The Residential Energy Efficient Property Credit was a tax incentive for installing alternative energy upgrades in a home. Most of these tax credits expired after December 2016; however, two credits are still available. The credits for solar electric and solar water heating equipment are available through Dec. 31, 2021, says Josh Zimmelman, owner of Westwood Tax & Consulting, a New York–based accounting firm. What changes next year: The percentage of the credit varies based on the date of installation. For equipment installed between Jan. 1, 2017, and Dec. 31, 2019, 30% of the expenditures are eligible for the credit. That goes down to 26% for installation between Jan. 1 and Dec. 31, 2020, and then to 22% for equipment put in between Jan. 1 and Dec. 31, 2021. If you work from home, your office space and expenses can be deducted, too. According to Vincenzo Villamena, managing partner of Online Taxman, you can take a $5-per-square-foot deduction for up to 300 square feet of office space, which amounts to a maximum deduction of $1,500. Understand, however, that there are strict rules on what constitutes a dedicated, fully deductible home office space. Here's more on the much-misunderstood home office tax deduction. What changes next year: This deduction will be eliminated for employees who have an office to go to but work from home occasionally, but it remains for all self-employed people whose home office is the main place they work. Many older homeowners plan to age in place—and if that entails renovations such as wheelchair ramps or grab bars in slippery bathrooms, the cost of these improvements results in a nice tax break. Deductible improvements might also include widening doorways, lowering cabinets or electrical fixtures, and adding stair lifts. Caveat: You’ll need a letter from your doctor to prove these changes were medically necessary. Furthermore, in 2017 these home improvements will need to exceed 7.5% of your adjusted gross income. So if you make $60,000, this deduction kicks in only on money spent over $4,500. What changes next year: Nothing. If you took out a home equity line of credit, or HELOC, in 2017 or earlier, the interest you pay on that loan is also deductible. People use these loans to do all sorts of things: pay for college, throw a wedding, or make improvements to their home. How much you'll save depends on the amount borrowed, but let's crunch some sample numbers. If you take out a four-year, $20,000 HELOC at 4% interest, you'll have an $800 deductible that will save you about $205 in the first year of your loan. (Use this calculator to see how much you'll save.) Joint-filing taxpayers could deduct up to $100,000 ($50,000 for individuals) in interest paid on home equity debt. What changes next year: The new tax law eliminates this tax deduction unless that HELOC is used specifically to "buy, build, or improve a property," according to the IRS. That's bad news for homeowners hoping to pay off college tuition, but still good if your home's crying out for a kitchen overhaul or half-bath.